Last Sunday when we lost an hour of sleep but gained an hour or daylight, Mr. Aitch and I decided we should get outside and take a much needed walk around our neighborhood. It was either that or we would have both taken a nap. We noticed some unusual changes. A little background info: When our development began in 1992, we were a rural delivery route and our address was RD 2 Box 153-D or something like that. Our mailbox was on one of the busiest roads in this end of the county and we risked life and limb to get our mail. A couple of members in our homeowners association worked some magic and got cluster boxes placed within our development the following year. In so doing we had to submit street names. There could not be a duplicate name of any street within the entire county so it was quite an undertaking but it was done and approved by the post office. We took it upon ourselves to have street signs made placed within the development. The county does not maintain or plow our roads since our roads do not connect one county road to another county road so they did not provide street signs. We had noticed some new street signs that we assumed were planted by the county. Our street signs are the wooden ones and the county signs are the green metal ones. 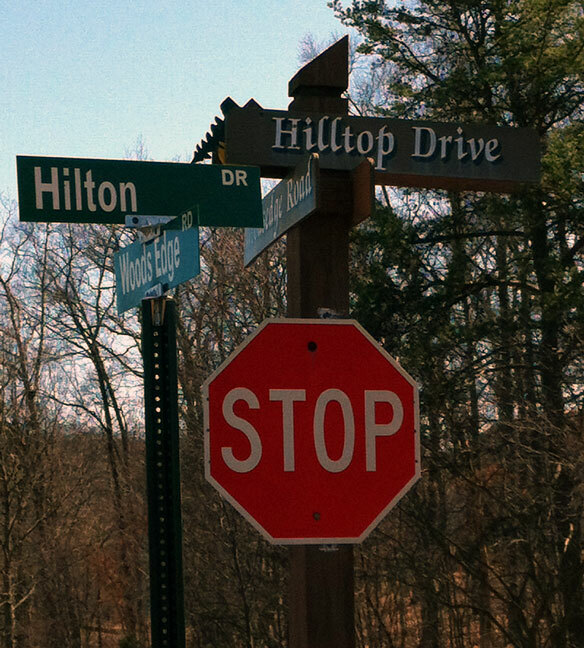 Hilltop Drive became Hilton Drive. Close but not the same. 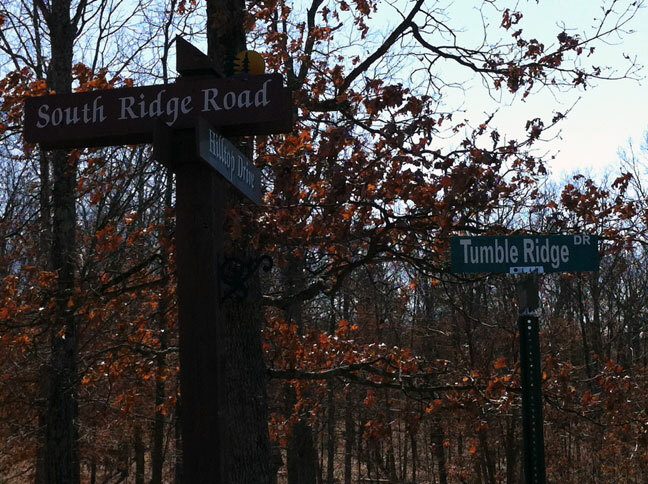 South Ridge Road became Tumble Ridge Drive. What? For 19 years these names were fine but now they’ve changed. The people who live on those two streets have to change their address. What a pain. Fortunately our street name not change. In our development of Greenwood Acres, we had to have a PO box. Right before we left, the county said we had to come up with street names for 911 purposes (though UPS never had a problem finding 25 Greenwood, but I digress). One lady in our development took it upon herself to come up with names and submitted them without discussion. My “street” would have been Hoot Owl Rd. I’d take Hilton over that. What a bummer. The wooden signs look so much nicer than the metal ones too. Rise up! Rebel! Toss that metal junk into the recycling bin!